The eighth season of excavations Of the “Selz Foundation Hazor Excavations in Memory of Yigael Yadin”, took place between June 24th and August 5th, 1997. As in previous seasons, work focused on two areas, Area A in the center of the site, and Area M, on its northern slope. The large exposure of the excavated area resulted in a much clearer understanding of the main architectural complexes than the one arrived at during the previous seasons. The investigation of the Israelite remnants present in this area, was continued. The majority of the Israelite remains uncovered during the 1997 season date to the 9th-11th centuries BC. In the northwestern section of Area A, a well stratified sequence of rooms belonging to buildings of the Israelite period, all cutting into the debris of the Canaanite palace, was encountered. These were associated with a rich ceramic assemblage, dating the buildings to the 8th-9th centuries B.C. A large number of circular pits, large and small, similar to those encountered by the Yadin expedition in the 50’s, as well as by us during previous seasons (Notes & News, IEJ 45, 1995: 65; 283; 46, 1996: 262-269) were encountered also during the 1997 season in area A. These pits, dating to Iron I, are concentrated mainly in the large courtyard extending to the east of the palace. There exact date and function – have yet to be determined. The main effort in Area A was focused on the expansion of the excavation of the Canaanite palace westwards, and of the palace courtyard to the east and north. By the end of the season the excavation of the large hall (=the “throne-room”) has been completed. The entire hall is paved by medium sized pebbles, which carried the actual (wooden? see Notes & News, IEJ 46, 1996: 264) floor. The the ceiling must have been supported by wooden pillars, which perished in the final conflagration; the location of at least one of these pillars, in the center of the hall – is clearly visible. Two doorways, located in the southern wall of the “throne-room”, lead into two rooms which are to be excavated during the 1998 season. These are located exactly opposite the two rooms located to the north of the “throne room” , excavated in 1996, which were exceptionally rich in finds. A small and narrow room located immediately behind the “throne room” , contained an installation, most probably a bath-tub, and a rich ceramic assemblage. The western part of the palace was severely damaged by later – Israelite building activities, leaving only the foundations of the western wall of the palace. These are lined by well cut orthostats, exactly similar to those lining the northern wall of the palace. The northern, eastern and western walls of the palace have thus been determined, the southern portion of the palace is to be excavated in the coming 1998 season. Ground penetrating radar (G.P.R.) tests conducted during the 1997 season showed clearly the presence of massive walls, probably also lined with orthostats, located immediately to the north of the palace. This may prove to be a northern annex to the palace, the excavation of which is also planned for the 1998 season. The uncovering of the huge courtyard, extending east of the palace has been continued; an area of 30 X 30 meters, paved by pebbles and plaster has been cleared. In the center of the courtyard, a rectangular raised podium, located exactly opposite the entrance to the palace was encountered. Its function must have been either civic or cultic.Thus far only the western and northern boundaries of this palace courtyard are known. The courtyard and palace are built on a rather steep slope. The construction of solid walls supporting fills was therefore necessary in order to create a platform on which the entire palace complex was to be constructed. The massive corner of walls exposed by the Yadin expedition in the 50’s is the north-eastern corner of this platform. Evidence for the violent destruction of the palace was encountered, as in previous years, everywhere in the palace and the courtyard. Among the fallen stones, bricks and ashes, an impressive variety of finds was encountered. These include pottery, cylinder seals, metal artifacts, ivories etc. 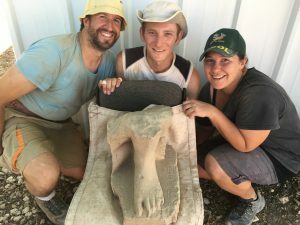 Remnants of yet another stone made statue of an Egyptian king was also found. Just like the similar statues found previously, this statue too suffered intentional mutilation in antiquity. 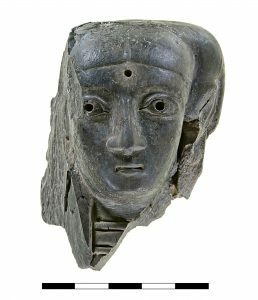 In spite of the rich Late Bronze ceramic assemblage recovered thus far, a more precise date within that period, will have to await further study. The scarcity of imported ware ,Cypriote as well as Mycenaean, in the Hazor assemblage – is noteworthy. A life size lion carved on a smoothed basalt slab, was found while dismantling an 8th century B.C. building, in the foundations of which it was incorporated. It most probably formed the left member of a pair which decorated the entrance to a temple or palace of the Canaanite period. An identical lion orthostat, the right member of such a pair, was discovered by the Yadin expedition in the 50’s buried next to the entrance of a temple located at a distance of approximately 1 km to the north, in the lower city. Is this the missing partner of the temple pair? An additional, almost complete lion orthostat, in secondary use as a door jamb of an Israelite building, was also uncovered during the season. Another part (=the head) of this lion, was uncovered by the Yadin expedition in the 50’s, a few meters away. It may thus be the second member of a pair which were originally positioned somewhere in the Canaanite palace. Excavations in area M the excavations were extended towards the north and the west. In the northern section, a large building of the Israelite building, of the 8th century B.C. was exposed, indicating what has already been noted during previous seasons, that Iron age occupation outside of the city walls – which at the time may have stood in ruins, was rather extensive. These later buildings of the Israelite period, and in particular the one just noted, caused severe damage to the remnants of the Canaanite period, immediately underneath. Only meager remains of an additional staircase located at the spot were encountered. This staircase is somewhat later than the one partially cleared during previous seasons. These staircases most probably connected the upper and lower parts of the town during the Canaanite period (IEJ 45, 1995: 285-287; 46, 1996: 266). The excavation of the Canaanite (cultic?) podium complex was expanded further west and north. Of major importance is the monumental gate leading into the paved area surrounding the podium. From here, the upper city might have been accessed, through the huge staircase. The presence of such a gate in this location has been suspected since the beginning of excavations in Area M in the early 90’s. As in previous seasons, the Hazor Expedition devoted a considerable effort towards the conservation and preservation of the major architectural assemblages uncovered. Most of the work this year focused on the conservation of the orthostats and mud-bricks from which the palace is built. New mud-bricks were made, employing the original materials of which the old mud-bricks were made, using as far as possible the same techniques of manufacture. These bricks were incorporated into several of thegaps in the palace walls. After being exposed for an entire year to the Hazor weather conditions, the stability and state of preservation of these new bricks will be checked. This data will become crucial once large scale conservation works at the site are begun. An olive oil press which originally stood in an 8th century B.C. dwelling, was also restored. All this work was carried out under the supervision of O. Cohen, the expedition conservator. The 130 participants in the 1997 season included groups from Complutense University Madrid, (directed by Prof. Maria Teresa Rubiato), the Southeastern Baptist Seminary of North Carolina (directed by Prof. Steven J. Andrews), a group of volunteers from Germany (directed by Winifred Hurst), and a group of archaeology students from the Institute of Archaeology of the Hebrew University of Jerusalem. Volunteers from several countries in Europe, the U.S. and Australia also participated. The “Selz Foundation Hazor Excavations in Memory of Yigael Yadin” are directed by Amnon Ben-Tor of the Institute of Archaeology of the Hebrew University. The Hazor Expedition also included: A. Zarzecki-Peleg (field archaeologist), and area supervisors: D. Ben-Ami, S. Cohen, D. Sandhouse, B. Villegas (Area A), M.Cimadevilla and S. Zuckerman (Area M). The staff also included S. Andrews, C. Melero, S. Moran, C. Rubio, and D. Zigler , (assistant area supervisors, Area A) and P. Cinquini and A. Prats (assistant area supervisors Area M). The excavation surveyors were R.Bonfil, I.Strand, and M.T. Rubiato . S. Becker M. Shalvin and I. Shmila were responsible for recording the finds. S. Yedid, aided by by I. Paritzki, was the expedition’s administrator. The excavations sponsored by the Israel Exploration Society and the Selz Foundation, in cooperation with the Southeastern Baptist Theological Seminary, are a joint project of the Philip and Muriel Berman Center for Biblical Archaeology at the Hebrew University and Complutense University in Madrid. The project also receives financial support from the Selz Foundation in New York and the Rothschild (Yad Hanadiv) Foundation. The excavations are carried out within the Hazor National Park, and benefit from the full cooperation of the National Parks Authority.